FileOptimizer is a lossless file size optimizer supporting AIR, APK, APNG APPX, CBZ, DOCX, GIF, GZ, EPUB, ICO, JAR, JPEG, MNG, MPP, PNG, PPTX, PDF, PUB, SWF, TIF, VSD, XAP, XLSX, and ZIP file formats among others. Aegis69 if you do not want to support the author (me), you can disable ads going directly to options. No need to pay, register or nothing. Program works very well. Very simple & fast batch process. I use this in conjunction with a old prog of mine and also a website that checks my posted files and can reduce further. No 1 program seems to do it all. Uninstaller should say YES not no. No complaints since Auth has now started listing with Symantic/Norton before release.as to false positive though does happen still at times. False positives are an issue for the crappy anti-viruses and those who blindly trust them, not for the developer. How can be an open source project which you are able to study or compile yourself be infected. Does not make sense. Virus Total reported that 6 of its 56 virus scanners detected malware. So, on that basis, don't install it - until thedeveloper has sorted this issue out. Bottom Line: Aegis69 if you do not want to support the author (me), you can disable ads going directly to options. No need to pay, register or nothing. great tool. a must have for bulk file optimizing! 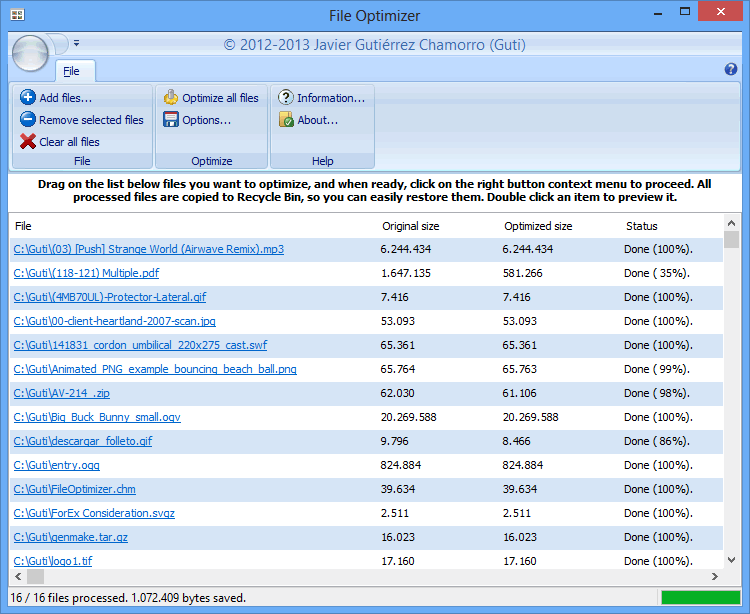 This is a nice bulk file optimzier tool, it really does slim down and optimize files. However it has 2 critical flaws which needs to be fixed. This is critical because if you want to rename your JPG files based on "date taken", it's stripped out and won't work. Under "options" there is a checkbox "copy metadata". I recommend you enable it for all applicable file extensions. This really should be enabled by default. 2.) There is no "abort" or "pause" button. You have to close out of the program to cancel operations. Understandable as it uses multiple command line operations/plugins, but it'd be nice if it was possible to abort. PDF/PNG/EXE compression compression is slow, especially on dual core systems (YMMV) sometimes not worth the effort considering most PDF/PNG/EXE files won't compress much further. In some cases EXE files also do self integrity checks on itself and related DLL files. Some cases it fails to run after compression. One example is WinWGetPortable, which failed NSIS self integrity check after compression of both EXE and DLL files. On a sample JPG photo created from a Canon EOS 60D (18 megapixels) it shrunk down the file size from 5.95 MB to 5.88 MB with no difference in picture quality, even zoomed up close. True to it's stated "lossless" description. On a sample PDF file, by default it downconverts to 150DPI, so images inside will slightly change when viewed close. Setting to "prepress 300DPI" should make it virtually exact. Good program for squeezing every last drop of space from files, just make sure to backup first, exclude certain program directories, enable "copy metadata" for all extensions, enable "keep file attributes", and change PDF DPI to "prepress 300" under program options.